You are back from work and tired. What will you do? grab an energy drink? Energy drinks do help you feel energetic (obviously) but at a cost. But what other choices one has? There are several and one of them is Cinnamon tea. Cinnamon is one of the most popular spices, which is used to a large extent all over the world. Obtained from the bark of several trees belonging to the Cinnamomum genus, it is used in the form of sticks and powder. There are a large number of health benefits which are associated with the consumption of cinnamon tea including reduction is cholesterol levels, it’s very high anti-oxidant content as well as control of blood sugar levels to help diabetic patients. In addition to the above mentioned benefits, cinnamon tea is also widely consumed as an energy drink. The various benefits of consuming cinnamon tea as an energy drink are enlisted below. How to prepare cinnamon tea? Cinnamon is known to contain almost a negligible amount of caffeine. In comparison to this, the well-known energy drinks contain on an average, at least 200 mg of caffeine per 8 ounces. Very high consumption of caffeine is unsafe and can result in nervousness, restlessness, sleep disorders, anxiety, chest pain, etc. Thus, it is necessary to regulate the amount of caffeine consumed on a daily basis. In contrast to the popular commercial energy drinks, cinnamon tea contains zero sugar! There is about 0.06 g of sugar per teaspoon of cinnamon powder. If you see specs of other energy drinks (like red bull), they are loaded with sugar. Excessive sugar can result in the development of diabetes, cardiovascular disorders, kidney damage and obesity. Thus, instead of obtaining energy from a high sugar-containing drink, we can consume healthier cinnamon tea. Taurine is an amino acid which is a regular ingredient in most energy drinks. Along with caffeine, it helps to improve mental performance and supports the development of the nervous system. However, not much is known about the long term effects of excessive taurine consumption. It is generally advised to restrict the consumption of taurine to less than 3000 mg/ day. However, it is always necessary to keep in mind to consume it moderately as a supplement. Cinnamon has no taurine and thus more safe in this regard. Creatine is a chemical which is naturally present in our body, mainly in the muscles. It is used to boost energy and muscle mass, mainly in athletes. Creatine has a tendency to draw water into the muscles, thus leading to dehydration. It can also result in cramping, stomach pain and nausea. In addition to this, when combined with caffeine in an inappropriate manner, it can lead to serious side effects including stroke. Consumption of very high amounts of creatine is unsafe. Creatine is present along with caffeine in many energy drinks and it should be consumed with caution. However, creatine is not present in cinnamon tea and thus, the consumer is protected from the ill-effects of excessive creatine consumption. Guarana is a plant which is found in the Amazon and is often used as a stimulant, for example popular energy drink Red Bull has Gaurana in it. It contains a very large amount of caffeine and is often used as a medicine. Although it is safe to consume in small doses, consumption of more than 250-300 mg/ day can lead to side effects. It can cause nervousness, stomach cramps, nausea, enhanced blood pressure, delirium and various other conditions. Thus, it is necessary to monitor the consumption of this compound. Pregnant women should be especially careful regarding their intake of guarana as consumption of more than 200mg/day is associated with enhanced chances of miscarriage. Cinnamon contains zero guarana and is thus safer to consume as compared to other energy drinks. Cinnamon tea is extremely cost effective and can be made fresh on demand. What’s more one can add more healthy ingredients such as ginger, basil, manuka honey, etc. to make it even more awesome in taste and health. This gives lots of flexibility in terms of making an energy drink “based on your requirement” unlike packaged drinks where this choice does not exist at all. 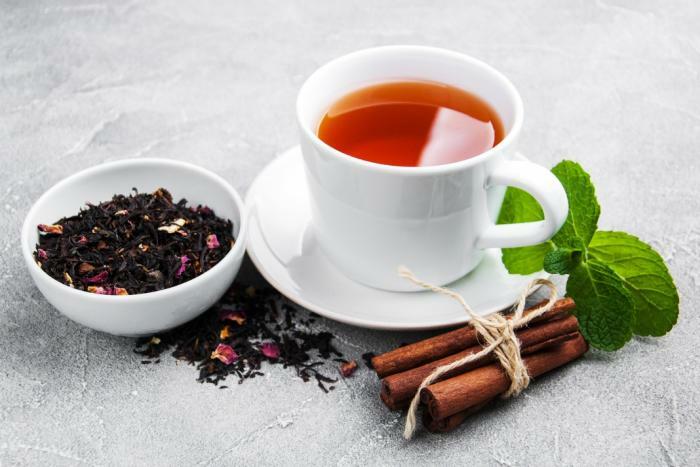 In addition to the above-mentioned benefits, cinnamon tea also contains very low levels of compounds such as carnitine, ginseng, and inositol. All these have been associated with certain harmful side effects. Thus, cinnamon tea offers several advantages over the commercial energy drinks. Take a cup full of water and boil it. When done, just add 1-2 gms of cinnamon powder into it and stir well. Add milk if you want. I like my tea to be with ginger (and sometime cardamom) so if you also want to do that. Just add these while you are boiling the water. Both of them are awesome for health and can help a lot. Basil – You can add a few leaves of basil too while boiling water. Basil is known to heal wounds, fights bacteria, cut cholesterol, useful for stomach disorders, helps joints, boost bran etc. Cardamom – Cardamom add awesome taste to tea (any tea!) but it also has several health benefits. It promotes heart health, helps in urinary disorders, protects against gastrointestinal diseases, helps in detoxification, etc. Lemon slice – If you love the sour taste, you will love lemon in your cinnamon tea. Just cut a think slice and let it do its work. Lemon is great for general health, skin, digestion etc. As a sweetener, you can add a small amount of manuka honey (make sure you chose a good quality one). Cinnamon and honey are known to have great benefits to health. I add honey when the tea has relatively cooled down and not in boiling water. This is a great way if you have cinnamon sticks. Also, this tends to give a better aroma (I felt so). The process is very similar to above, just that as we are using sticks, we have to put them into boiling water so that cinnamon can mix in water. For this one needs to boil water for a longer time, but slowly for – around 7-10 min, I have seen some people doing it for 20 min too. But I found 10 min was good enough. As we plan to boil water for a longer time, take 1.5-2 cups of water, add the cinnamon stick. I found that smaller portions of stick work better than a large stick as then there is a larger surface area where water can interact with cinnamon. Just strain the tea and add other things such as milk, honey, etc. to it. My only issue with making cinnamon tea with stick is one does not know how much cinnamon we are taking! But if taken occasionally it should be fine. It is necessary to ensure that you purchase good quality cinnamon to make the tea. Cassia cinnamon contains a high level of a cytotoxic compound known as coumarin which can cause kidney damage. Ceylon cinnamon, on the other hand, has very low levels of coumarin. Thus, it is necessary to use good quality, pure cinnamon. The consumption of cinnamon (especially cassia) should be restricted to 4-6 g/day and large dosage should not be consumed for extended periods of time. Please consult a doctor or a physician before you use cinnamon for health purposes especially if you are on medications. Cinnamon tea is a very good energy drink and can be consumed to obtain various health benefits. It is the healthier option as compared to various other conventional energy drinks, is cheaper and easy to prepare at home. So try it today! How to Identify Pure Argan Oil? Can I strain the tea after it seeps? I prefer drinking just the cinnamon tea without the grounds.